What is a Doula and How can you Benefit from Having one? From the beginning of time, women have been cared for and nurtured as they become mothers. Family, friends, and the community would gather around the new family to support and guide them during the early weeks and months with a new baby. Now today, we have doulas to be a part of mom’s support system and nurture her. 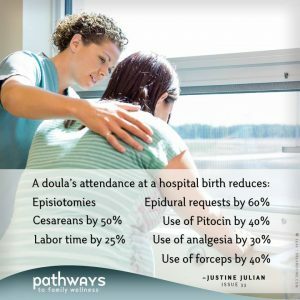 Whether it’s a family’s first or tenth baby, a doula can help support the family, and make the birth and postpartum experience better. – Continuous uninterrupted presence; freedom from other obligations, other patients, hospital polices etc. – only there for mom! The acceptance of doulas in maternity care is growing rapidly with the recognition of their important contribution to the improved physical outcomes and emotional well being of mothers and infants. For more information check out “The Doula Book,” and https://www.dona.org. Did you know that Tara is a certified DONA doula? Ask her any questions! https://blossomfamilychiropractic.com/wp-content/uploads/2017/10/doulas2.jpg 220 450 Tara Bassi https://blossomfamilychiropractic.com/wp-content/uploads/2019/01/blossom-logo-grey-l-1030x216.png Tara Bassi2017-10-23 15:29:132017-10-23 15:30:38What is a Doula and How can you Benefit from Having one? Business of the Month Highlight: The Birth Center of St. Pete Happy National Chiropractic Month (October)!